In home security, one part that many of us ought to be aware of is the mechanism of our security devices. Door latches or latch locks are generally types of mechanical fastener which is used to combine two or more objects together whilst enabling the regular or eventual separation of the objects. This is different with the door locking mechanism of doors and windows. Door latches usually engaged another piece of hardware on the other mounting surface. The following are the various forms of door latches which range in their protection and security complexity functions. – Cross bar Type. It is just about the most simple and also a somewhat low security type of latch lock, the mechanism incorporates a bar which happens to be secured with fixing plates and slide across in front of the door opening right into another fixing plate having a small handle to operate. An incredibly primitive version of this lock is a wooden beam that is placed into front of the door fixed on with angled fixing plates preventing ability to access the inside. – Cabin Hook Type. It is among the most common latch locks, which is used along with a padlock. A Latch is commonly used which then hooks over a staple, the staple is connected to a fixing plate where screws are hidden when the latch is in locking position and a padlock is added to prevent entry to the door. An alternative form of cabin hook is a staple attached small metal hook, which fits into an adjacent staple on the opposite surface which means that entry from the exterior is hard yet not possible without having the hook disengaged. – Spring Latch Locks. A well-known and convenient lock that snaps shut every time the beveled latch seats into a striker plate are the spring-latch lock. Yet, this lock can be easily shoved by placing in the door frame a thin blade or stiff plastic between latch and the strike plate. A large tool like a hammer may be used to physically breach the doorknob and lock only if a metal plate is installed to reinforce the wood. Therefore, a spring lock should be improved by a second lock of a totally different type. – Dead Lock Type. 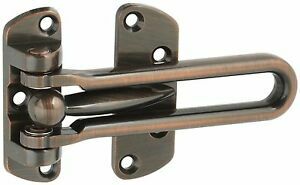 This has a solid, rectangular latch that forms a bolt between the door frame as well as the door itself. This lock is difficult to force and is a great choice as an auxiliary to any other key lock. It’s intended for either key operation or manual interior knob. It is normal to home exterior doors. – Cam Type. This kind of lock is utilized on lockers in places such as schools, educational institutions. This is so that students can secure their lockers with the use of a padlock in some cases a small combination padlock making sure that the person/s do not lose any keys. The cam type of this is quite similar in mechanism towards the cabin hook latch lock in where a padlock is placed over the latch cam lock when in the locked position to secure the device.